A planning application for an extension to a popular night spot in Cookstown has been refused, after emotional objections were voiced at council. Mid Ulster councillors were presented with an ‘approval’ recommendation for the extension to Moe’s Bar on Chapel Street, at last Tuesday’s planning committee. 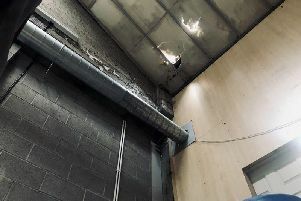 The application which had been previously recommended for refusal at the former Cookstown council, included an extension to the public bar, restaurant area, an open courtyard, and walled smoking area. SDLP councillor Tony Quinn who accompanied the local residents objecting to the development, said they fully supported any development which would create jobs for the local economy. “However if this application were approved, this would have a serious and detrimental effect on their lives,” he said. The councillor claimed that squads of PSNI officers were deployed to the area near the bar to deal with public disorder on Sunday, April 26 and again on Sunday, May 3. Cllr. Quinn asked why the PSNI had not been consulted in the application, and why the residents were not consulted over the amended plan. It also emerged that Transport NI had raised concerns over the development and advised against it. Colin McCaffrey who lives just a matter of metres from the nightspot described the recent disorder as ‘mini-riots’. In a strong and emotional appeal to the planning committee, Mr McCaffrey stated the “reasons given for refusal of the application in November are still just as relevant today”. He also claimed that an increased level of noise from the proposed new beer garden would force some residents to leave and find a more peaceful area to live in. After a proposal to defer the decision, head planning officer Dr Chris Boomer stepped in and advised council to decide one way or the other. Councillor Denise Mullen proposed that the application be refused, which was seconded by Cllr. Sharon McAleer. The council refused the application on the grounds of increased noise and nuisance and a possible deterioration of highway safety.